America Used to Have an Overseas Empire. What Happened to It?Daniel Immerwahr’s How to Hide an Empire serves both as a history of American empire, and a warning about the Trump administration’s bellicosity. The Best Argument for Bernie Sanders Is His Democratic GlobalismSanders is already building alliances with progressive forces the world over. 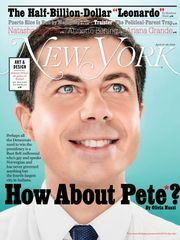 Elizabeth Warren should start doing the same. Trump Calls on U.S. to Recognize Israeli Sovereignty Over the Golan HeightsThe president just vowed to nullify the international law prohibiting states from acquiring new territory through military conquest. No, the Left Should Not ‘Learn to Love’ the Military-Industrial ComplexGiant Pentagon budgets do provide a couple million Americans with jobs and health care. But the goal is to deliver those goods to all Americans. Marco Rubio Mistakes Venezuelan Journalist Named Germán Dam for an Actual DamIn a tweet over the weekend, the Florida senator mistook a journalist covering the crisis in Venezuela, Germán Dam, for a hydroelectric barrier. Warren Unveils Bill Barring U.S. From Initiating a Nuclear HolocaustHer new bill would make it official U.S. policy not to use nukes first in an armed conflict. Republicans call this dangerous and irresponsible. President Trump Reportedly Wanted the U.S. to Leave NATO in 2018A new report says Trump privately expressed his desire to ditch the historic defense pact — which just happens to be something Russia wants too. American Exceptionalism Is a Dangerous MythAmerican foreign policy has always been shaped by interests, not ideals. Liberals must grapple with that reality if they wish to change it. Lindsey Graham Adds to Confusion Over Trump’s Plan to Leave Syria“I think we’re slowing things down in a smart way,” Graham said after a meeting with Trump Sunday. GOP Leaders Won’t Tolerate Trump’s Chaos for Much LongerWith Trump’s erratic behavior at home and abroad inflicting damage on the financial markets, Republican lawmakers may finally turn on him. Read Defense Secretary Mattis’s Full Letter to Donald TrumpJames Mattis tendered his resignation today, and wrote a letter to the President explaining his reasons for doing so. U.S Troops Are Maybe, Eventually Leaving SyriaThe Pentagon says our campaign against ISIS is shifting, but nobody knows how. Why Nuclear Weapons Are Shaping Up As a Big 2020 Campaign IssueLast time that happened, George H.W. Bush wasn’t just alive, he was a candidate. Trump’s Sanctions Won’t Change Iran’s Behavior, But Could Boost Its Hard-linersThe move increases pressure on Iran’s relatively moderate government, but it’s unlikely to advance the Trump administration’s ambiguous policy goals. Sanders Makes a Strong Case Against the Saudis (and for Bernie 2020)Foreign policy gave Bernie Sanders’s last presidential campaign nothing but headaches. Now, it’s giving his next one a reason for being. Trump Won’t Let Khashoggi’s Death Cost Working-Class Saudi Lobbyists Their JobsThe president says that the U.S. can’t afford to lose all the jobs that the Saudi alliance creates. But he really means “the swamp” can’t. The U.S. Has Deep Ties to Saudi Arabia — But Disentangling Ourselves Is PossiblePulling away from Saudi Arabia over Khashoggi is a risky prospect. Trump clearly isn’t interested, but there are steps U.S. lawmakers could take. What Is Tulsi Gabbard Fighting For?The war veteran and Democratic congresswoman is a rising star for progressives. But her views on foreign policy illustrate a dilemma on the left. Trump’s Weak Khashoggi Response Tells Dictators They Can Get Away With MurderIf Trump fails to punish the Saudis for Jamal Khashoggi’s apparent murder, it will signal that money and flattery are worth more than U.S. morals. Nikki Haley’s Rare Feat: She Did It Her Way, Not Trump’sDespite significant foreign policy differences in the GOP, she managed to avoid alienating either faction — or her notoriously volatile boss. 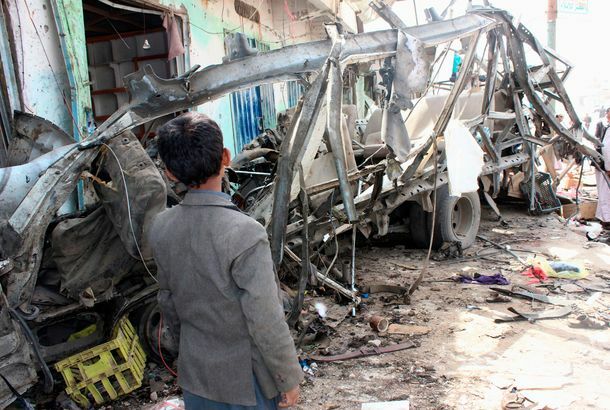 Pompeo: Saudis Are Definitely Trying to Commit Fewer Mass Murders in YemenPompeo’s certification clears the way for the U.S. to continue abetting a Saudi-led intervention, which has already killed thousands of civilians. Trump’s Effort to Strong-Arm Palestinians Will Bring More Suffering, Not PeaceCutting aid and shuttering the PLO office aligns with Netanyahu’s plan to crush the Palestinian national movement, but will only prolong the conflict. After Promising Quick Syria Exit, Trump Is Said to Approve of Indefinite StayA U.S. official claimed Trump is “on board,” but this only bolsters claims that administration officials ignore the president’s orders. 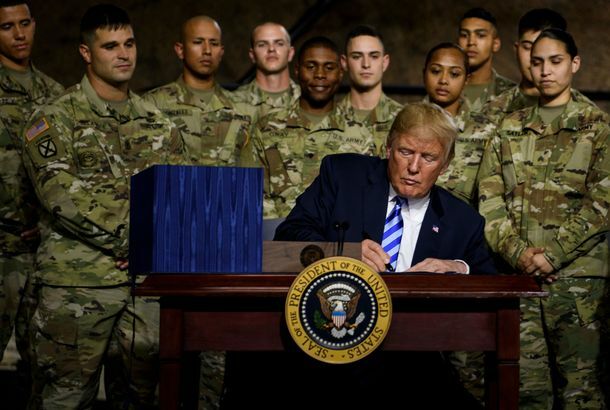 Trump Signs Defense Bill, Says He’ll Ignore Many Limits Set by CongressTrump claimed he can override restrictions on cooperation with Russia, efforts to reduce civilian casualties, and even mere information requests. U.S. Officials Worked Behind Trump’s Back to Keep Him From Blowing Up NATOJohn Bolton reportedly demanded that the latest NATO agreement be hammered out before July’s summit, so Trump wouldn’t have a chance to derail it.